Tomas Zeron, director of the Mexican Agency of Criminal Investigations, who was in charge of the investigation into the disappearance of students, has resigned, after a new independent probe rebuffed the official version. 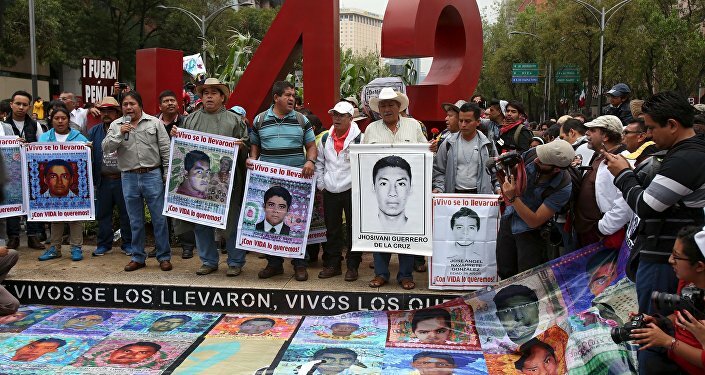 MOSCOW (Sputnik) — In September 2014, a group of Ayotzinapa College students heading from Guerrero state to Mexico city to protest against a proposed education reform was kidnapped allegedly by local authorities with six people killed on the spot and 43 more missing. The official investigation concluded the missing students were killed and subsequently burnt on a dump site by a local gang cartel. But a new independent study revealed no evidence of a blaze large enough to consume 43 bodies, the Telesur broadcaster reported. Following the resignation of Zeron, the country's attorney general would probe into the investigations led by the former official, the media outlet added. In April, a report commissioned by the Inter-American Commission on Human Rights (IACHR) accused Mexican authorities of hampering an independent inquiry by the Interdisciplinary Group of Independent Experts (GIEI) into the disappearance of the students. Experts of the five-member panel said they had been obstructed in their work and complained over lack of access to evidence they needed to establish the truth behind the suspected murder of dozens of teacher students.